Get San Francisco Giants 2014 World Series Champs Gear TODAY! MADISON BUMGARNER MVP #SFGiants #WorldSeries T-SHIRT ‘…that boy would try to steal a steak off the devil’s plate.” -Kevin Bumgarner, Madison’s dad – T-shirt or poster, mugs,etc. Better’ – Also available in Posters, Mugs, etc. 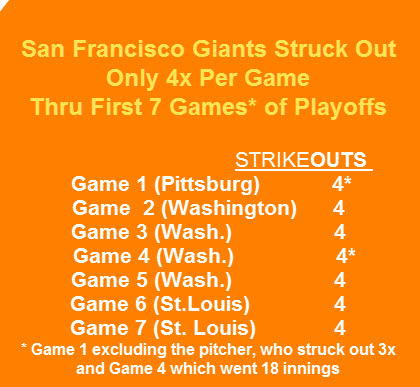 KC ROYALS Were SFGiants PHARM TEAM for their First World Series Victories in 56 Years! And look who’s here – none other than Melky Cabera and Jose Guillen – two key (PED) elements in the #SFGiants World Series Victories 2010 and 2012! Unlikely Blanco would have an MVP-type postseason in 2012. – The Giants call their repeated late season surges ‘Lightning in a Bottle’ , but what exactly is in that bottle? 2014: The Beat Goes On…. 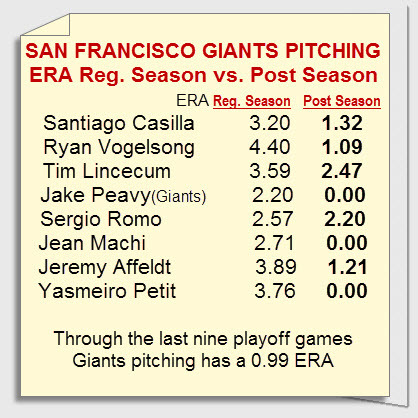 How have Peavy, Vogelsong, other Giants pitchers raised velocity, lowered ERA -0.99 10 games? Can continue? BONUS: Why No Longer Any Great (100 Game-Winning) Teams in Baseball?